B&B Ad Centrum di F. Fraccaroli is in the historic citycentre (universityarea), at about 600 metres from the Arena, about 450 metres from Juliets house. We are also really close to the most important historic spots of the city: the roman sites, the medieval churches and the modern buildings; while in the evening within a short walk it is easy to reach the many osterie, the traditional restaurant in which it will be possible to taste Veronese food and the important wines of this area (the white wines like Soave and Custoza or the red wines like Bardolino and Valpolicella). 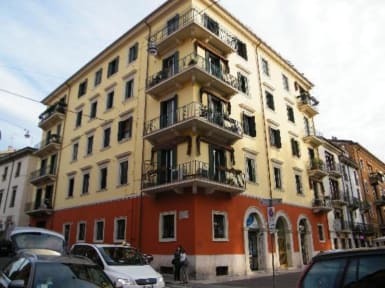 The B&B was recently renewed and is located in a historical building at about 1 km from Verona Porta Nuova Rail Station, so it can be easily reached from this station with buses: 11, 12, 13, 14 (during the day) and 92, 93, 94, 98 (night service). Our rooms are furnished with stylish and precious mobilia, equipped with private bathroom ensuite, TV and Air Conditioning. *we can reserve a special parking pass that allow you to park in the resident parking areas around our B&B. *we can allow you to use a furnished kitchen ready to be used. 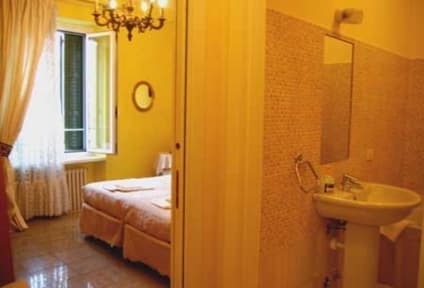 In case of neccesety the B&B Ad Centrum will always be able to offer an accommodation equivalent to that one booked, always in the heart of Verona, always with private BAathroom, TV and Air Conditioning!! When you reserve you explicitly accept this option!